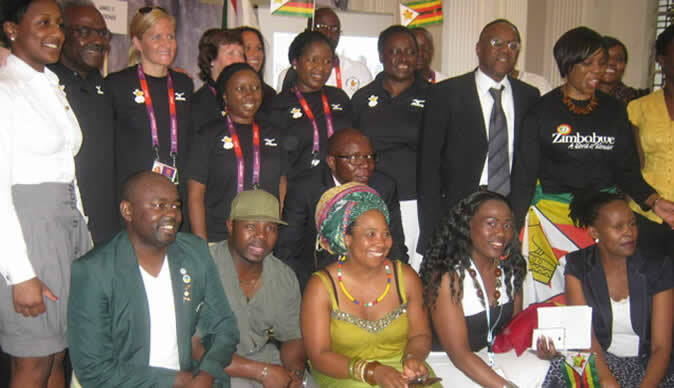 The small squad of Zimbabwean Olympians who are hoping to do the southern African proud at this year's London 2012 games, get a final send off from their diasporian compatriots tomorrow (Thursday 26 July 2012) at a fundraising dinner in their honour. The event, organised by the Zimbabwe Diaspora Olympics Support Network (ZDOSN) will be held at the Stratford Old Town Hall on Thursday evening, with a programme packed with entertainment, eats and presentations. Zimbabwe's Ambassador to the UK, Gabriel Machinga has urged corporate and sporting stakeholders and "Zimbabweans and Africans of all walks of life "in the UK, to attend the event. "I feel so proud to be part of this momentous occasion where Zimbabweans have selflessly dedicated their time to organise an event to embrace our Olympians. We now want to see other Zimbabweans in the UK come and support our boys and girls. We are a golden nation and Zimbabwe will not settle for anything other than gold," Machinga said yesterday addressing Team Zimbabwe at the embassy office in central London yesterday. Songstress Cynthia Mare, Mbira maestro Linos Wengara, as well as Reggae singjays Decibel and Roby G, are set to perform at Thursday's event which will also be attended by boxer Derek Chisora, Councillor Joy Laguda (MBE), the Newham councillor and Cabinet member. Luganda, who is of Zimbabwean heritage, said: "I wish the competitors all the best and I am proud to have this team of talented athletes in our neighbourhood. Let's all rally round together, support them the best way we can." By virtue of its alphabetical naming and not for lack of sporting excellence, Team Zimbabwe's will troop out at the very tail end of all other nations at Friday's London 2012 opening ceremony. Swimming ace and seven-time Olympic medallist, Kirsty Coventry, will lead the team out carrying the flag ahead of marathon runners Sharon Tawenga, Wirimai Zhuwawo (marathon) and Cuthbert Nyasango. Also in tow will be rowers Jamie Frazier Mackenzie and Micheen Thornycroft and Chris Felgate, Zimbabwe triathlon representative. Admission for the Team Zimbabwe fundraising event is √É‚Äö√Ç¬£20.00.